Do the things you have to do so you can do the things you want to do. I think I heard this for the first time on a tv show when a father was teaching his son a lesson about school. I have repeated this line repeatedly to my boys. Last night hubby and I watched Disneys movie, “Up”. The story is important to my blog so stick with me please. If you haven’t seen “UP”, this post is a big huge spoiler. Stop now if you don’t want me to ruin it for you. “up” it a love story about a regular couple. No princess, no animals and no catchy songs. Carl and Ellie meet as kids, get married, lose a baby, never have another child, and are happy with the life they share. 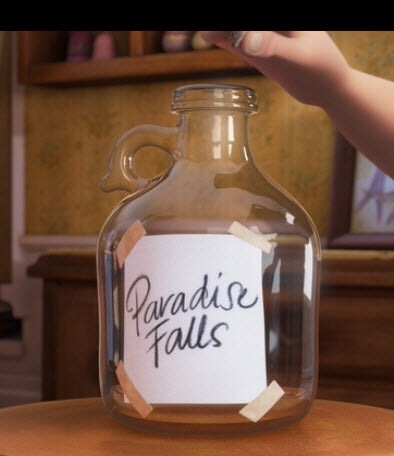 As their love grows they start a fund to live in Paradise Falls someday. Everyday life keeps draining the money jar.A broken window, a flat tire, and a broken leg were just some of the unexpected events which delayed their trip. Just not enough money. Like most Disney movies, a big sad moment and lesson comes when as an older couple Ellie passes away with Carl at her side. Through his mourning and bitterness he remembers the Paradise Falls jar and decides to make their dream of going on the trip a reality. Nothing will stop him. Finally he decided above all else he would complete this trip for the love of his life. How he does or doesn’t do it isn’t really important. It’s the point that after his wife, his anchor, the one he would put his life down for is gone. They didn’t find the time and now it’s too late to do it together. As I write today I’m reading about an unexcusable, senseless shooting in Las Vegas. At this time it’s being reported that over 400 have been injured and 50 killed. The numbers keep going up. A shooter cowardly sat in his safe hotel room and took aim on 22,000 people happily watching a country concert. I’m sure they were singing, dancing and having a spectacular time. None of the victims could have thought this may be my last moment on earth. Let me be clear. In my opinion everyone of those attending, the working, the first responders and all of their friends and families are victims. They will live with this memory the rest of their life. They should have the fun times of the concert to remember not this horrible event which may not have been able to prevent. Does that really matter right now. It happened and the after effects are horrendous. My heart is hurting thinking about the unfulfilled dreams those killed never were able to make happen. Maybe the car broke down so their money had to go to fix it instead of taking the trip cross country/world with their family. Maybe they had a wife or girlfriend at home waiting to have a baby. What about the bachelor and bachlorette parties Vegas is know for. How will the future spouse cope? I know life is about the have to. Without it you can’t do the big things you want to do. That’s the responsible thing to do. Maybe you work a little harder to get a little bit more. Not easy for most I know. Scrimp, save so you can’t fulfill that dream. Life is short is a common saying . How often do you think about your dream then tell yourself it’s impossible? What about the person(s) you were going to fulfill the dream with like Ellie and Carl? Maybe fulfilling dreams is a “have to” as well. I am so fortunate. I try to remember to tell my husband daily how much I appreciate his hard word, how much he loves me and our boys. He just got done working 18 days straight to pay for this Disneyland trip. We are driving down I-5 as I type. This trip is important. Memories for all of us are important. We, as a family did what we had to do so we can now do what we want to do. Sometimes it’s leaving the dishes undone to go for a bike ride. Movie and game night is important in our house. I want to fulfill my families dreams before the end of my life. Yes we are all going to die. It’s a fact of life. To quote a song by the great Greorge Strait “Life’s not the breaths you take, But the moments that take your breath away”. I want thousands of breath taking moments with my family. It’s up to me to find the things me. Do the things I have to do to have the time. This has been hard to type through my tears. It may have a lot of spelling and grammatical errors. I don’t care. I hope just one person reads this and makes some time. Find a way to fulfill your dreams. Big ones, small ones, ones that cost a lot, and especially those that are free that you can do everyday. Yes, life is short and full of the unexpected. Live it now. Find that thing that will take your breath away today.